Methane in the Arctic threatens to escalate into runaway global warming. The poster shown in the video is added below. Click on the poster to view a higher-resolution version, for printing out and hanging it on the wall. Methane is often said to have a Global Warming Potential (GWP) of 21 times as strong as carbon dioxide, a figure based on IPCC assessment reports that date back to the 1990s. However, the IPCC has updated methane's GWP several times since, as illustrated in Table 1. below. In its Fourth Assessment Report (AR4, 2007), the IPCC gives methane a GWP of 25 as much as carbon dioxide over 100 years and 72 as much as carbon dioxide over 20 years. Moreover, in the context of tipping points, which seems appropriate regarding methane releases in the Arctic, it makes sense to focus on a short time horizon, possibly as short as a few years. Accordingly, methane's GWP can best be visualized as in the image below, which is also displayed mid-right on the poster above. 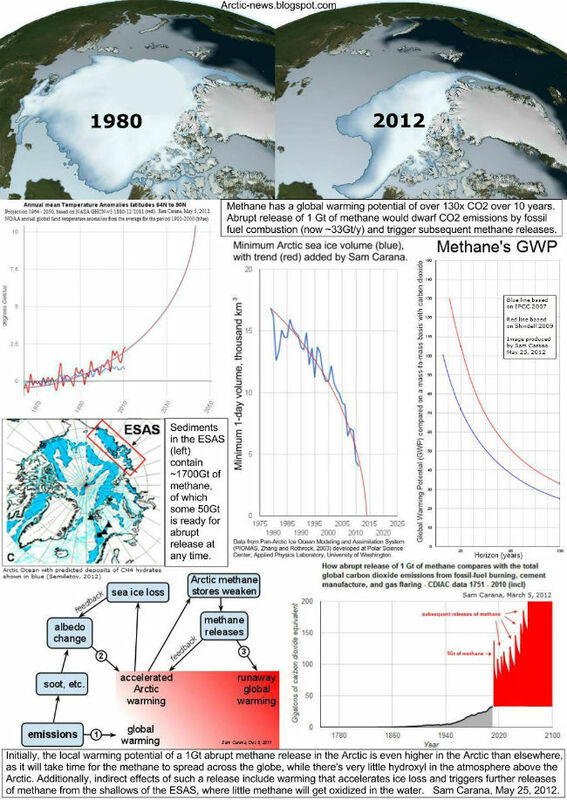 The image on the left shows methane's global warming potential (GWP) for different time horizons, pointing out that methane's GWP is more than 130 times that of carbon dioxide over a period of ten years. 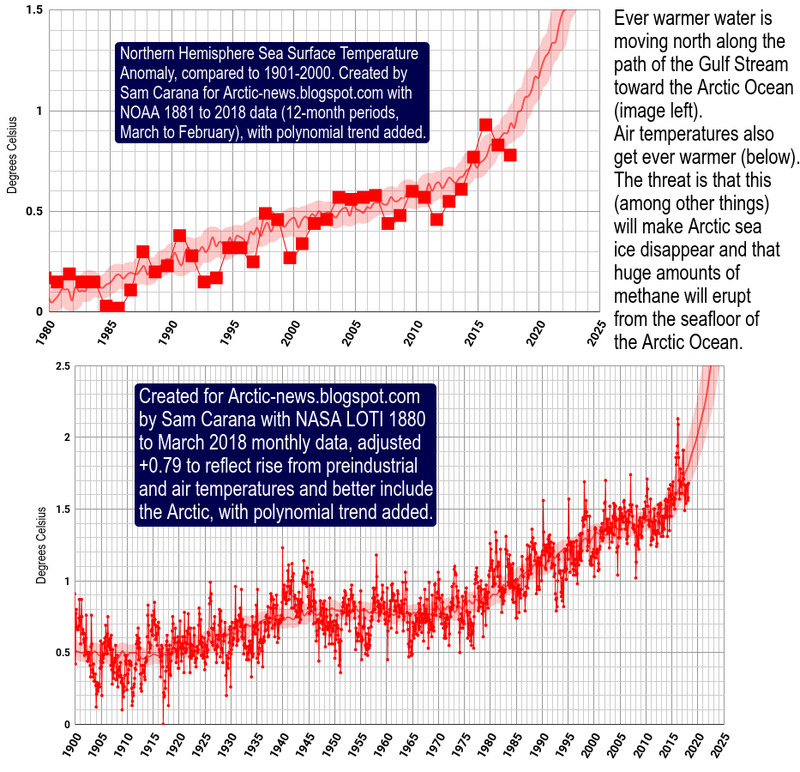 IPCC1 figures were used to create the blue line. The red line is based on figures in a study by Shindell et al.2, which are higher as they include more effects. This study concludes that methane's GWP would likely be further increased by including ecosystem responses. The ecosystem response can be particularly strong in the Arctic, where the seabed contains huge amounts of methane. Continued warming in the Arctic can cause large abrupt methane releases which in turn can trigger further methane releases from sediments under the sea. This is particularly worrying, not only because of the presence of huge amounts of methane, but also because the sea is quite shallow in areas such as the East Siberian Arctic Shelf (ESAS), which in the case of large abrupt releases can soon lead to oxygen depletion in the water and make that much of the methane will enter the atmosphere without being oxidized in the water. Additionally, low water temperatures and long sea currents in the Arctic Ocean are not very friendly toward bacteria that might otherwise break down methane in the water. 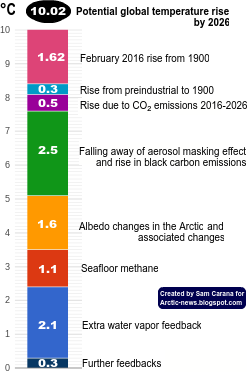 For further background, also see the post The potential impact of large abrupt release of methane in the Arctic at the Arctic Methane blog3, and the FAQ page at that blog.